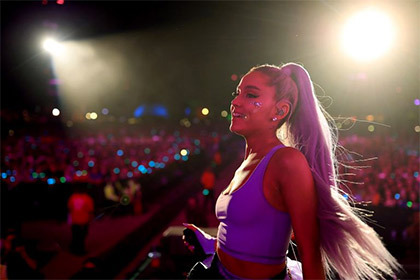 After a difficult couple of months in her personal life, Ariana Grande surprised fans by dropping the mother of all breakup anthems. The 25-year-old teased the new single on Instagram on Saturday before posting a link to "thank u, next" on Saturday night—a song that doesn't feature on Ariana's recently released Sweetner album. After a week of rumors about things turning sour between Ariana and her ex-fiance Pete Davidson, she reportedly released the song just half an hour before Pete appeared on Saturday Night Live and actually spoke about their breakup in a skit before encouraging viewers to vote in the US mid-terms this week. Anyway, back to "thank u, next": Ariana does not hold back in this song. She bravely lays out her vulnerability by publicly addressing ex-boyfriends by name before coming to a really healthy conclusion that what's most important for her right now, in light of everything she's been through over the past couple of years, is the relationship she has with herself. Yassss. Ariana dives straight in by naming four of her most high-profile relationships followed by a brief line about each of them. "Thought I'd end up with Sean. But he wasn't a match." Ariana dated rapper Big Sean for eight months before calling it quits in April 2015 with their reps saying they both "deeply care for each other and remain close friends." The two had worked together with Sean rapping on "Right There" in 2013 and "Problem" in 2015. "Wrote some songs about Ricky. Now I listen and laugh." Ariana dated her backup dancer Ricky from the summer of 2015 for roughly a year. They kept things relatively low-key but the pair were first linked when they were seen kissing in that donut-gate video. In the "thank u, next" lyrics, Ariana says she wrote songs about Ricky. Her friend and co-songwriter Victoria Monet told Billboard that the song "Moonlight" from the Dangerous Woman album was written about Ricky as that was his nickname for Ariana. "Even almost got married. And for Pete, I'm so thankful." Ariana also references her most recent relationship with Pete. The couple got together in May, confirming it with an adorable joint picture of them in Harry Potter costumes. Things went from zero to 100 real quick, when Ariana sported a rock on her ring finger just three weeks into their relationship. What followed was a few months of some PDA, matching tattoos (now covered up), a pet pig and public declarations of love before the couple stunned fans by suddenly breaking up and ending their engagement in October. After a week of suggestions that the couple is not on the best of terms since their split, Ariana's track begs to differ by affirming she is thankful for her relationship with Pete, even if the whole wedding thing didn't work out. "Wish I could say 'Thank you' to Malcolm. 'Cause he was an angel." The most poignant line is about her former boyfriend of two years Mac Miller (real name Malcolm McCormick) who tragically passed away in September 2018, where Ariana says she wishes she could speak to him and let him know what he meant to her. Since his death, she has posted a series of tributes to Mac on Instagram and now appears to be looking after his dog. A week after his death, she wrote: "I adored you from the day I met you when I was nineteen and I always will. I can't believe you aren't here anymore. I really can't wrap my head around it. We talked about this. so many times. I'm so mad, I'm so sad I don't know what to do... I'm sorry I couldn't fix or take your pain away. I really wanted to. the kindest, sweetest soul with demons he never deserved." "One taught me love. One taught me patience. And one taught me pain. Now, I'm so amazing. I've loved and I've lost. But that's not what I see. So, look what I got. Look what you taught me." Ariana finishes off the ex-boyfriends segment by rounding up what she's learned from each relationship and how it will help navigate her future. When she talks about "pain," it could be about Mac given both the tragic circumstances of his death and the struggles they had during their relationship (which Ariana spoke about on Twitter after they broke up). "Thank you, next. I'm so f****n' grateful for my ex." "I met someone else. We havin' better discussions. I know they say I move on too fast. But this one gon' last. 'Cause her name is Ari. And I'm so good with that." Alluding to when people said she had moved on too fast from Mac, she teases that, since Pete, she's found someone else... HERSELF. And that's the relationship that's going to last the longest. "She taught me love. She taught me patience. How she handles pain. That sh*t's amazing. I've loved and I've lost. But that's not what I see. 'Cause look what I've found. Ain't no need for searching." Ariana shares what she's been through after a couple of years of painful moments—the Manchester attack, struggles with her mental health, Mac's death and the end of her engagement. But she also hints at how ultimately, she's going to come out stronger from the lessons she's taught herself. "One day I'll walk down the aisle. Holding hands with my mama. I'll be thanking my dad. 'Cause she grew from the drama." 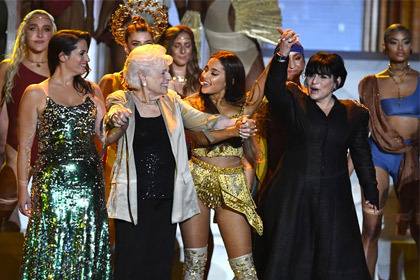 Ariana says it will be Joan who walks her down the aisle, whenever she does choose to get married. She also mentions her dad, who she has rarely discussed before (he split up from Joan when Ariana was eight). Their relationship hasn't always been easy and in 2014, Ariana told Seventeen the toughest thing she ever had to deal with was falling out of touch with her dad. "It's private, but it happened last year," she said. "It took me so long to be okay with it... I had to accept that it's okay not to get along with somebody and still love them." Ariana's not talked about her dad much since but posted a Happy Father's Day picture on Instagram in 2017. Despite their relationship having its ups and downs, she says she is grateful for him. "One day I'll walk down the aisle... Only wanna do it once, real bad. Gon' make'that sh*t last." But, if another relationship does fall apart, it doesn't matter as she's strong enough to deal with it and, well, her career success—independent of any man or relationship—speaks for itself. "God forbid something happens. Least this song is a smash."